Navalón - Verdejo P., et al. Development of a “Fast-Track” Protocol for Hydrocele Surgery. (2016) J Anesth Surg 3(2): 194-198. © 2016 Navalón - Verdejo P. This is an Open access article distributed under the terms of Creative Commons Attribution 4.0 International License. Objectives: To describe a multimodal recovery protocol (fast-track surgery) for hydrocele surgery, as developed by our urology department over the course of the last 10 years. Likewise, our aim was to demonstrate the use of this protocol improves the cost effectiveness of the procedure, compared to the classical procedure which requires hospital admission and general or spinal anaesthesia. Material and Methods: We compared two groups of patients. The first group underwent hydrocelectomy under our multimodal recovery protocol in an outpatient setting, with data collected prospectively, while the second group of patients underwent hydrocelectomy before the implementation of the multimodal recovery protocol, with hospital admission and general or spinal anesthesia, with data collected retrospectively. The results obtained were assessed and satisfaction degree ascertained by survey. Results: The results obtained with fast-track protocol were comparable to those of conventional surgery. Only two of the patients needed to be admitted in hospital due to postoperative complications, which it was not related with the outpatient setting treatment. The satisfaction degree with the treatment was found to be over 95%. Conclusions: Virtually all patients affected by hydroceles could be suitable candidates for a fast-track surgery programme, with the consequent improvement in cost-effectiveness of the procedure with no reduction of the quality of care received or patient satisfaction. Enhanced Recovery After Surgery (ERAS) concept, also known as “fast-track surgery” or “multimodal rehabilitation after surgery”, was developed in the early 90s when a group of researchers stated different approaches to improve postoperative recovery in patients undergoing elective Surgery[1-3], of note among which are the value of patient counselling and taking the patient as an integral part of the postoperative recovery time, being the main goal of this concept a reduction in the lenght of hospital stay and minimization of inherent complications of Surgery[4,5]. Although fast-track surgery was initially described in colorrectal disease, the good outcomes obtained with this approach has resulted in its practice by other specialties, such as anesthesia, thoracic surgery, gynecology, urology, where this concept has shown an improvement in postoperative recovery[6-9], using protocols which advocate a multimodal approach, combining postoperative procedures based on scientific evidence in order to reduce surgical stress and improve postoperative recovery[10,11]. Moreover, the growing interest in both, improving the cost-effectiveness of hospital processes and producing lower social and labour disruption in patients has favoured Major Outpatient Surgery (MOS) advance unstoppably. One of the methods used to achieve these short-term stays in hospital is precisely this new concept of “fast-track surgery”, as an expression of a coordinated effort that combines modern concepts of patient education with new schemes of analgesics, anesthetics and minimally invasive surgical techniques[12-15]. Hydrocelectomy is the most frequently urological surgical procedure performed in MOS[16-18], since hydrocele is a frequent complaint for urological consultation[19-22] and surgical technique meets all inclusion criteria recommended in the spanish MOS guidelines. In January 2000 our urology departmentbecame part of the MOS unit at our centre, since then 1000 patients have undergone hydrocelectomy in a strict outpatient surgery setting. However, it was not until mid-2005 when we designed a protocol following the fast-track surgery concept for hydrocele intervention. This protocol has been periodically updated guided by outcome sassessment, being the last update in January 2012. To perform this study, we compared two groups of patients, group 1 comprising by patients underwent hydrocelectomy following the multimodal recovery protocol (group fast-track), with data collected prospectively, and group 2 comprising by patients underwent hydrocelectomy before multimodal recovery protocol was designed (classical group), where patients were treated under the classical concepts of hospitalization and surgery with general or spinal anesthesia. In this group data were collected retrospectively. Between January 2012 and January 2016 we have performed a total of 358 hydrocelectomies. 312 patients aged between 14 and 89 years (mean 54.8) underwent hydrocelectomy following the updated mutimodal recovery protocol comprising the fast-track group. Hydrocele was in the left side on 198 patients, in the right side on 144 patients, and bilateral in 46 cases. Regarding physical status of patients, according to the American Society of Anesthesiologists criteria, 165 patients ASA I (53%), 95 patients ASA II (30%), and 52 stable patients ASA III (17%) were included in the fast track group. included in the fast track group. A detailed history taking anda complete physical examination with scrotal ultrasound was performed during the first medical visit. Preanesthetic assessment was requested and information about the procedure was given, signing the informed consent in all cases. In addition a brochure explaining the process was given to the patients (Figure 1 and Table 1) which included all pre and postoperative instructions as well as a telephone number for assistance if any complications arose. Once the preanesthetic assessment was complete, patients were noticed by telephone about the date for his hospital admission. Figure 1: Explanatory brochure (back cover). Table 1: Explanatory brochure (front cover). 2. Eat a light dinner the night before of surgical procedure. Then you have to fast. 2. Eat a soft meal during the first 24 hrs after the surgery. Do not drive. Do not drink alcoholic beverages. 3. The day of the procedure don’t eat or drink anything ( Except if you were prescribed with some medication) 3. You may have pain in the surgical site. You will take the analgesic prescribed during the first 48 hrs. 4. To minimize the risk of wound infection shave your groin area and the corresponding side of scrotum and take a shower the morning of the day of surgical intervention. 4. You may have a little rise in body temperature (100, 4° F). It’s normal during the 48 - 72 hrs. If you have a higher body temperature, let us know. 8. Come to the hospital with a responsible adult. You cannot drive cars either before or after the procedure. 8. If you have any situation (i.e. bleeding) go to the emergency department or call us (609 360 315). Hydrocelectomy was performed in all patients using the following surgical sequence: EMLA cream (lidocaine 25 mg/g + prilocaine 25 mg/g) was topically applied in the corresponding previously shaven scrotum and groin area approximately one hour before surgery. Infiltration of the spermatic cord with local anesthetic (10 - 20 ml of lidocaine 1%), is done by clamping the spermatic cord at level of the root of scrotum (where vas deferens leaves the superficial inguinal ring). In cases of giant hydroceles it is advisable to infiltrate the cord in the same place, fixing it to the pubic bone. Also scrotal skin was infiltrated where the incision was performed. A transversal incision of no longer than 3 - 4 cms was performed, trying to preserve the scrotal vessels. Exposure of the tunica vaginalis and aspiration of fluid until the sac get a size that allows be removed through the small skin incision. Longitudinal incision of the sac and plication of tunica vaginalis around the entire circumference with absorbable suture or eversion was performed. Introduction of the testicle in the scrotum and closing wound with absorbable suture. We consider in admissible the systematic use of intrascrotal drainage tubes. In all cases antibiotic prophylaxis was performed using a single dose of 750 mg cefuroxime I.V. Postoperative recommendation were given, describing the administration of minor analgesics, use of a scrotal jockstrap and extreme hygiene measures of the surgical wound. After surgery, all patients remained under observation about 1 hour until discharge. Patients received, by medical staff or nursing, postoperative phone call the evening of the intervention and the next morning to control their postoperative conditions and to reassure the patient with inattentive feelings that could cause outpatient surgery. If necessary, the patient is referred to the emergency department of our centre. The postoperative medical visits are performed a week after surgical procedure, at 1 month and at 3 months later. At medical office we performed a short anonymous survey about satisfaction degree about the treatment received. To compare the results with a control group of patients operated classically group by inpatient surgery and spinal or general anesthesia (classical Group), retrospectively studied patients undergoing hydrocele during the 2 years prior to the establishment of fast-track protocol. Thus, during January 2003 to January 2005 they were performed 70 hydrocelectomies 64 patients aged between 18 and 82 years (mean 58.1). Hydrocele was left at 38, right in 26 and bilateral in 6 cases. Regarding the physical state, 39 of them were qualified ASA I (61%), 18 ASA II (28%) and 7 ASA III well compensated (11%). In classical group, 53 patients (83%) underwent surgery under spinal anesthesia and 11 patients (17%) under general anesthesia and they all were hospital admitted, with a mean lenght of stay of 1.41 ± 0.8 days (range 1- 5). Regarding statistical analysis of the results, the data are expressed with the mean, standard deviation and range. 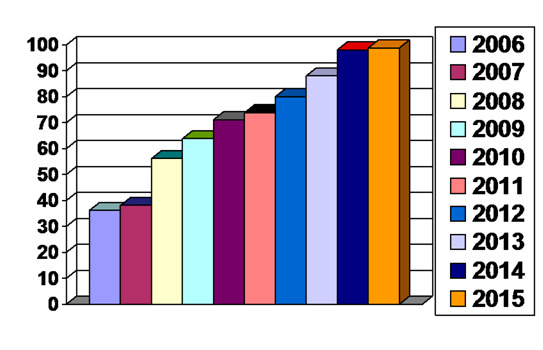 The analysis was performed using SPSS 19 (SPSS Inc., Chicago, IL). When it was necessary to compare groups, the Student-t test was used, considering statistical significance a p < 0.05. When we compared qualitative aspects, the chi-square test was used. There were no statically significant differences between both groups with respect to age, anesthetic-surgical risk, laterality of the injury or etiology of the hydrocele, therefore both groups were homogeneous. All the patients from the fast-track group has undergone surgery with local anesthesia, however, in 32 cases (10%) it was necessary to add sedo analgesia through an infusion of propofol and remifentanil due mostly to the severe anxiety symptoms in some patients instead of pain or intolerance to the procedure. The average time used in the surgical intervention in the fast-track group was 25 ± 9 minutes in the unilateral cases (range 15 – 45) and 35 ± 10 minutes in the bilateral ones (range 25 – 55). In the classic group, the time was significantly greater (p < 0,005), being the average 50 ± 15 minutes (range 40 – 75) in the unilateral hydroceles and 60 ± 15 (range 45 – 80) in the bilateral ones. All the patients from the fast-track group were discharged after the intervention, with none of them requiring hospital admission because of immediate intra or postoperative complications. A total of 15 patients (4.8%) were attended in the emergency department during the first postoperative day, 8 of them because of intense pain in the surgical incision which was resolved increasing treatment regimen of oral analgesia with 2 of them adding anxiolytic treatment; the other 7 patients becauseof bleeding from wound, where 2 of them required admission and surgical exploration. Patients from the classic group, stayed in hospital, being the mean lenght of stay of 1.41 ± 0.8 days (range 1 – 5) with none of them presenting important complications, with the exception of 2 patients who received spinal anesthesia and required urethra vesical catheterization because of acute postoperative urinary retention and 1 patient that required surgical exploration because of gross bleeding from wound. After discharged, 6 patients (9%) were attended in the emergency department because of pain and scrotum swelling which was resolved with minor analgesics, lacking of statistical significance when being compared to the other group. Three months after the intervention, all of the patients presented a satisfactory evolution, with 296 (95%) of the patients from the fast-track group answering the survey about the treatment received in the MOS Unit, where 247 (83%) rated it as “Excellent”, 40 (14%) “Good”, 9 (3%) “Regular” and none (0%) “Deficient”. Hydrocele is easily diagnosed by physical examination, but ultrasound is often very useful for diagnosis of concomitant disease. Thus, in all of our patients a preoperative scrotal ultrasound was performed, which we consider it very important, mainly to rule out testicular tumor as the cause of the scrotal swelling. Moreover, in the present protocol, the ultrasound study is included in the first preoperative medical visit, which significantly increases the efficiency of the medical visit thus fulfilling the concept of “high resolution consultation”. The standard treatment for hydrocele has always been surgical. Evacuation punctureis a low complexity technique often requested by patients, but it will never solve the problem, so recurrence is the norm. Similarly, sclerotherapy has been presented as an alternative to hydrocelectomy in high-risk surgical patients, or patients who have dismissed surgery as treatment. However, some recently studies have been published advocating sclerotherapy as the treatment of choice instead of hydrocelectomy[22-25]. Several agents have been employed for this purpose, with different results reported depending on the agent used and the number of instillations performed, apparently dependent on the size of the hydrocele. Some authors make a correlation between the number of injections of sclerosing agent and the size of hydrocele, where the procedure needs to be repeated more than three times in hydroceles with a volume less than 500 ml. Moreover, sclerotherapy have a high incidence of side effects (postoperative pain, infection, hematoma, scrotal induration by granulomatous enlargement of the tunica) and a high rate of recurrence (usually multilocular and difficult to treat) and can cause epididymis obstruction, so it should be contraindicated in young patients in whom fertility is a priority. In addition, sclerotherapy is totally contra indicated in young patients where the existence of a communicating hydrocele is suspected. Worthy of note is a recent meta-analysis that concluded sclero-therapy have a high rate of long-term recurrence compared to hydrocelectomy. We prefer lidocaine as a local anesthetic instead of other amide compounds, beacause of its lower cardiotoxic effect (if it were accidentally injected into the bloodstream), its faster anesthetic action and its less painful sensation during injection. We prefer to make a transverse hemiscrotal incision following skinfolds and scrotal vessels, as it allows minimal bleeding and offers better cosmetic results (scarremains hidden by these folds). In case of bilateral hydrocele, we prefer a unique longitudinal incision on median raphe, because it allows us access to both hydroceles from a single incision. We always advocate making small incisions, because once the hydrocele is evacuated, if it was a large incision, it often become disproportionate. In our experience, with a 3 - 4 cm in length scrotal incision, even giant hydroceles can be solved. Basically, there are three surgical techniques described for hydrocele: Lord’s technique (vaginal plicature), Jaboulay’s technique (vaginal eversion) and Andrews technique (vaginal resection). Whenever the tunica vaginalis is thin, Lord’s technique is the preferred procedure, because of tissue dissection is low, it provides less bleeding and edema and avoids the use of drainage tubes. In cases of enlargement of the tunica vaginalis we recommend Andrews technique and the use of a drainage tube, because even if hemostasis were perfect, we must leave out the excess of transudate fluid that may occur. It’s a fact when starting a MOS unit in a hospital, an increasing number of patients are treated there. We could observe after introducing the hydrocele fast-track protocol, it was a gradually increasing rate of patients treated under an outpatient setting and less patients treated withhospital admission (classical setting). Thus, after the first year of the implementation of hydrocele fast-track protocol, the outpatient setting surgery rate was 35%, reachingat present almost 100%, as shown in [Figure 2]. Figure 2: Replacementrate of “classical” by “Fast-track” hydrocelectomy. Implementation of fast-track protocols in the surgical treatment of hydrocele leads to a reduction of hospital lenght of stay and decrease postoperative morbidity, improving the cost-effectiveness of the procedure. Almost all scrotal fluid collections can be resolved under local anesthesia in a strict outpatient setting. Nowadays hydrocelectomy under spinal or general anesthesia with hospital admission is an unnecesary overuse of health care resources and should be avoided. 1. Hoffmann, H., Kettelhack, C. Fast-Track Surgery – Conditions and Challenges in Postsurgical Treatment: A Review of Elements of Translational Research in Enhanced Recovery after Surgery. (2012) Eur Surg Res 49(1): 24-34. 2. Wang, L., Fang, F., Lu, C., et al. Safety of fast-track rehabilitation after gastrointestinal surgery: Systematic review and meta-analysis. (2014) World J Gastroenterol 20(41):15423- 15439. 3. Kehlet, H. Fast track surgery: realidades y dificultades. (2006) Cir Esp 80(4):187-188. 4. Sánchez-Urdazpal, L., Salido, S., Alday, E., et al. Implementation of an ERAS program in liver surgery. (2015) Nutr Hosp 31(5): 16-29. 5. Nanavati, A., Prabhakar, S. Fast-track surgery: Toward comprehensive peri-operative care. (2014) Anesth Essays Res 8(2): 127-133. 6. Fearon, K.C., Ljungqvist, O., Von Meyenfeldt, M., et al. Enhanced recovery after surgery: a consensus review of clinical care for patients undergoing colonic resection. (2005) Clin Nutr 24(3): 466-477. 7. Pędziwiatr, M., Matłok, M., Kisialeuski, M., et al. Enhanced recovery (ERAS) protocol in patients undergoing laparoscopic total gastrectomy. (2014) Wideochir Inne Tech Maloinwazyjne 9(2): 252-257. 8. Taupyk, Y., Cao, X., Zhao, Y., et al. Fast-track laparoscopic surgery: A better option for treating colorectal cancer than conventional laparoscopic surgery. (2015) Onc Let 10(1): 443-448. 9. Ortega, S.M., Martínez, J., Júdez, D., et al. The results of implementing a fast-track protocol in radical cystectomy in a tertiary hospital. (2015) Actas Urol Esp 39(10): 620-627. 10. Moreno, P. Cirugía endocrina en régimen ambulatorio. (2006) Cir Esp 80(5): 273-274. 11. Ortega, J., Cassinelloa, N., Lledó, S. Cirugía tiroidea con menos de 24 horas de hospitalización. Resultados tras 805 tiroidectomías consecutivas en un programa de alta precoz tipo fast-track. (2007) Cir Esp 82(2):112-116. 12. Ministerio de Sanidad y Consumo. 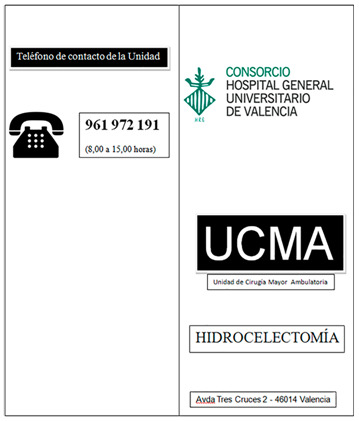 Dirección General de Aseguramiento y Planificación Sanitaria. Cirugía Mayor Ambulatoria: Guía de Organización y Funcionamiento. (1993) Madrid. 13. Jarrett, P. The time has come to promote true day surgery. (2000) Amb Surg 8(4):163-164. 14. De Lathauwer, C., Poullier, J.P. How much ambulatory surgery in the world in 1966 – 1977 and trends. (2000) Amb Surg 8: 191-193. 15. Rodríguez, J.M., Rodríguez, R., Blanco, G. Cirugía Mayor Ambulatoria en Urología. En: Porrero JL. Cirugía Mayor Ambulatoria 2ª Ed. (2002) Barcelona: Masson 311-333. 16. Navalón, P., Zaragoza, C., Cánovas, J.A., et al. Ambulatory surgery in urology Analysis of our experience. (2004) Arch Esp Urol 57(5): 513-514. 17. Generalitat, Valenciana. Conselleria de Sanitat: “Guía de actuación en Cirugía Mayor Ambulatoria”. (2002)Valencia. 18. Llopis, B., Navarro, J.A., Mola, M.J. “Ambulatory surgery in urology. Five years of experience”. (2003) Actas Urol Esp 27(2):117-119. 19. Elizande, A., Regojo, O., Navarro, J. Urología en un programa de Cirugía Mayor Ambulatoria. (2004) Actas Urol Esp 28(5):144-147. 20. Barthold, J.S. Abnormalities of the testes and scrotum and their surgical management In: Wein AJ, Ed. Campbell-Walsh Urology 10th ed. Philadelphia (2011) Saunders Elsevier 3357-3396. 21. Rodriguez-Tardillo, A., Guzman, P.L., Miñana, B. En: Castiñeiras J. Libro del Residente. (2007) ENE Ed SA Madrid 911-926. 22. Merenciano, F., Rafie, W., Amat, M., et al. Hydrocele Sclerotherapy and cord cyst with polidocanol. Efficiency Study. (2001) Actas Urol Esp 25(10):704-709. 23. Nogueras, M., Marrón, M., Guinda, C., et al. Cost-effectiveness of ultrasound in a urology department. (2006) Arch Esp Urol 59(4): 325-331. 24. East, J.M., DuQuesnay, D. Sclerotherapy of idiopathic hydroceles and epididymal cysts: a historical comparison trial of 5% phenol versus tetracycline. (2007) West Indian med J 56(6): 520-555. 25. Beiko, D., Kim, D., Morales, A. Aspiration and sclerotherapy versus hydrocelectomy for treatment of hidroceles. (2003) Urology 61(4): 708-712. 26. Musa, M.T., Fahal, H.W., Arabi, Y. Aspiration sclerotherapy for hydroceles in the tropics. (2016) Br J Urol 76(4): 488-490. 27. Romero, M., Ibáñez, R., Solano, D. Anatomical and technical foundations of the non-hemorrhagic treatment of simple hydrocele. Technical contributions. (1994) Arch Esp Urol 47(3): 271-272. 28. Sampietro, A., Vaquerizo, A., Fernández, A. Major outpatient surgery in urology: our experience. (1995) Arch Esp Urol 48(4): 343-344.